Tonight I would like to talk about temples of learning. 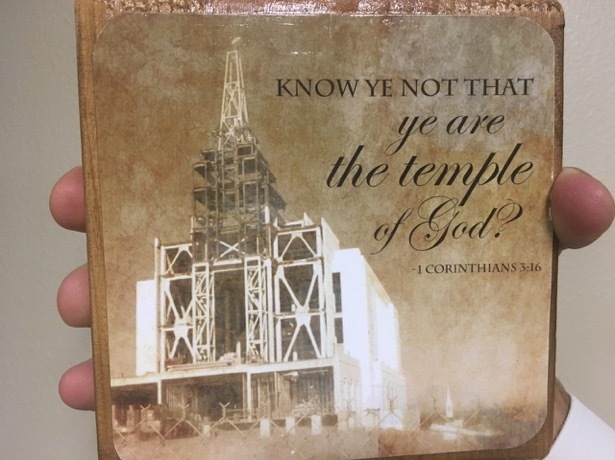 The temple, a house of learning, is perhaps the greatest symbol of our faith.1 And it is there that we can “receive a fulness of the Holy Ghost.”2 In our home, Christine and I have prominently displayed two treasured images of the temple. 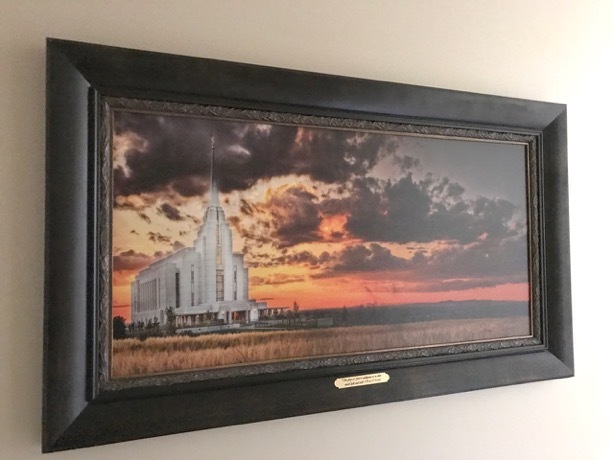 The first is a large canvas print of the Rexburg Idaho Temple just after its completion. It stands as a beacon on the hill, shining with almost celestial radiance. The second image is much more modest, but its message is equally important to our family. It is a woodcut block that fits in my hand and shows the same temple under construction. You can see its true form emerging, but it has not yet achieved its divine purpose and potential. At BYU-Pathway Worldwide, we are constructing temples of learning — both in the lives of our students and in the organization that serves those students.3 From the young man in Puebla who traveled hours for the first PathwayConnect gathering in Mexico City, to the single mother in Utah forced into a situation she never planned, to the father in West Africa seeking to provide for his family, to the returned missionary in Boston who never thought college was a possibility — BYU-Pathway students are constructing temples of learning in their own lives. Likewise, all those who work with BYU-Pathway Worldwide are building temples of learning in the very creation of this new organization. 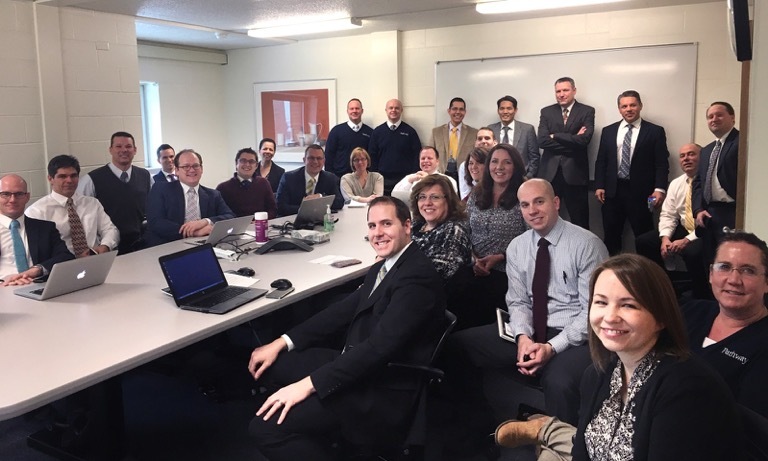 This is a photograph of Pathway employees in Rexburg as they watched a live stream of the First Presidency announcing the creation of BYU-Pathway Worldwide. Without prior notice, nearly 50 families were informed not only that they would be part of this new organization, but also that they would be asked to relocate their families to support its growth. Constructing a temple of the Lord requires that we keep Christ at the center and build according to His plans.4 We must preserve that vision, so we don’t get lost or give up when things get difficult. We can grow in confidence as our temple structure begins to take form. But even then, we remember it is not our temple alone, but a temple of the Lord. We must stay close to the plans He has given and seek direction from those He has asked to watch over its construction. Why is the Church So Committed to Education? 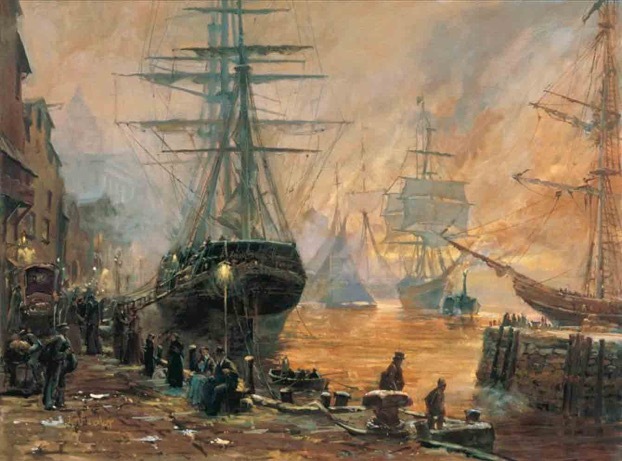 I love the painting by Ken Baxter entitled “Embarkation of the Saints.” It’s a reminder to me that these early converts to the Church were poor, largely uneducated immigrants. And yet this same people would establish a pattern of making individual commitments to frontier academies and great universities. But our focus on education isn’t rooted in a cultural norm or historical precedent, it isn’t rooted in the hope for financial security, or even a desire for intellectual edification. To disciples of Jesus Christ, education is part of the path to conversion and the resultant call to reach for our divine potential. President Henry B. Eyring has taught that “[c]onversion brings a drive to learn.”7 In this sense, education reflects our efforts to become perfected in Christ. Before launching the original Pathway program in 2009, we studied members of the Church who were not attending or completing college. We shared with them prophetic statements about the importance of education, which were universally well received. So why were they not pursuing education? The top reasons were cost, fear, and access. PathwayConnect was then designed to address these constraints. The burden of cost is mitigated through what remains a remarkably affordable educational program. The fear of failure is addressed through a curriculum that is designed to build spiritual and academic confidence. 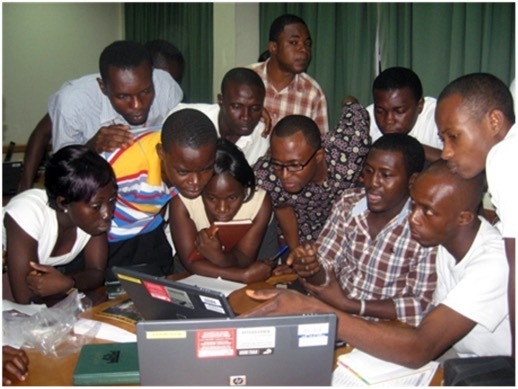 The lack of access is lessened as students learn online and at local gatherings around the world. As the Pathway and online degree programs expanded, the number of students who never came to the campus at BYU-Idaho eventually exceeded the number who did. At my own BYU-Idaho inauguration just two years ago, President Dieter F. Uchtdorf stated that “today’s challenges cannot be solved with yesterday’s tools.”13 Two years later, he announced the creation of BYU-Pathway Worldwide saying it would have the responsibility to coordinate all online certificate and degree programs in the Church Educational System. Subsequent counsel from the Church Board of Education suggested that because BYU-Pathway needed to operate wherever the Church is organized, its focus would be on access and not the broader resources that come with a full-service university. In other words, while education remains a religious priority, it is also a personal responsibility. The Church will help you jump-start your path, but it won’t pave every possible road on your journey. So what does this mean? A focus on access means our core emphasis will always be on the first-year PathwayConnect program and its role in building hope and confidence. Our secondary emphasis will remain on highly relevant gateway certificates. BYU-Idaho President Henry J. Eyring described these certificates as engaging students “early in the practical elements of a discipline, with the goal of stimulating curiosity and boosting confidence.”14 After completing their certificates, students can progress to a limited number of valuable degree programs that meet the following criteria: 1) high employability; 2) high student demand; 3) consistent degree structure including credit requirements and stackable, standard degrees; and 4) consistent online course design standards. This curricular focus allows us to offer more prescribed student advising, freeing resources for mentoring and retention efforts. 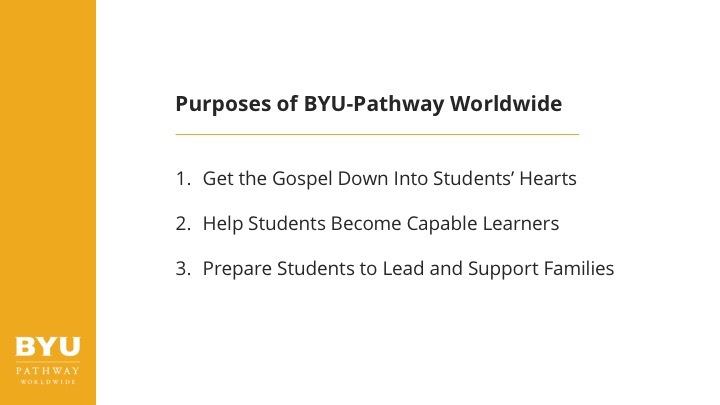 It is not by accident that BYU-Pathway Worldwide would grow out of BYU-Idaho, with its student focus and modest beginnings. 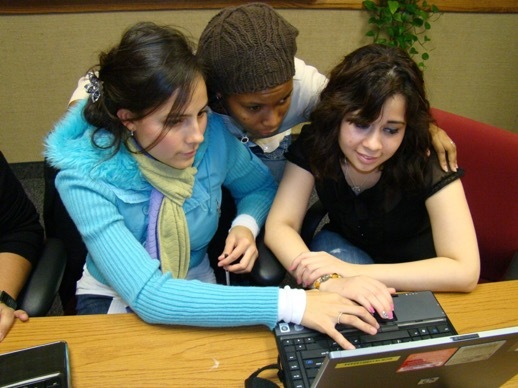 It is not by accident that it would come from BYU-Idaho, with its prophetic charge to “reach a little lower” and “lift … a little higher.”15 Without BYU-Idaho, our students would not have access to the high-quality online courses developed by the campus faculty and online course design teams in Rexburg. In turn, BYU-Pathway injects an understanding of remote online-degree students in a way that not only strengthens the online programs, but also offers BYU-Idaho a window into the needs of everyday students on their own campus — needs that are sometimes hidden in the ever-increasing pull of specialized bachelor’s programs. BYU-Pathway will also work closely with LDS Business College in creating a flagship Pathway site in Salt Lake City as a hub of educational innovation for job skills and career preparation. We will continue to coordinate across the Church Educational System, Self-Reliance Services, and the missionary department as we construct this temple of learning. Only in The Church of Jesus Christ of Latter-day Saints could so many resources work in such remarkable harmony. President Henry B. Eyring has stated that “[e]very innovation, every change, will be measured against this test of the heart. 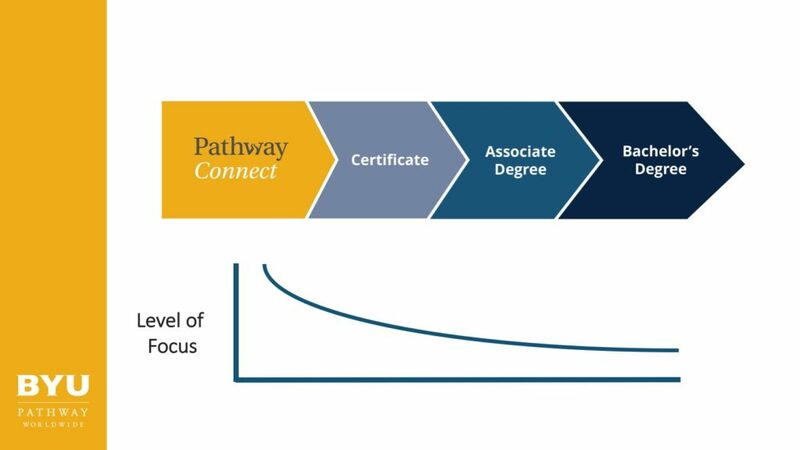 How would this proposed change build testimony and true conversion to the restored gospel of Jesus Christ in the heart of a student?”16 BYU-Pathway is not just about earning a degree or finding a job. Our focus is grounded in the fundamental work of building disciples of Jesus Christ. To help students become capable learners, we seek for what Elder Clark has called deep learning, where students lift one another in developing the whole soul.17 Note that the very design of our courses allows students to teach and learn from each other. President Henry B. Eyring counseled that while “it would be easy to look for ways to help learners learn alone, using the wonders of technology. The same technology could give learners the experience of helping others they love to learn with them.”18 Our courses are cohort-based, interactive, and provide opportunities for students to work together. 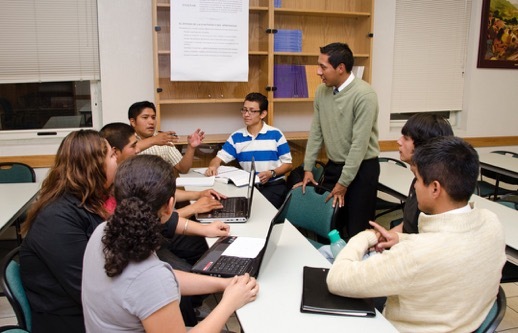 When they exercise faith and teach one another, students invite the Holy Ghost to become the true teacher, and they learn at an accelerated pace.19 This point is particularly important as we look to expand this organization across the Church because our students will have opportunities to learn at a rate and a level they could not do without the help and guidance of the Holy Ghost. May we realize we are building temples of learning in our own lives and in the kingdom. I share my testimony and my love for the Savior Jesus Christ. I know this is His work. In the name of Jesus Christ, Amen.